The Travelling Open Studio is a literal open studio – a pop up artists’ studio that has been touring the county as part of Somerset Open Studios 2016, where members of the public are invited to come and create work inspired by the landscape in a new location each day. The studio – with its artist/curator Alice Maddicott – visited Halsway Manor on Monday 26 September, and local school children were invited to join her. “On Monday I was at the beautiful setting of Halsway Manor, national centre for folk arts in the heart of the Quantocks. Local primary schools Crowcombe and Stogumber brought two classes – younger children in the morning and older in the afternoon – and we set about creating our own imaginary Halsways inspired by the setting. Starting with creative writing and how we can use something as ordinary as a wooden floor or a fireplace or grass outside to inspire an imaginary world where things can be however you want them to be, each child created their own Halsway. We explored both inside and the grounds, collecting descriptions and ideas, before coming back in to draw and design them. We then created an amazing collaborative story world map, a few metres long, with all the different imaginary Halsways linking together! 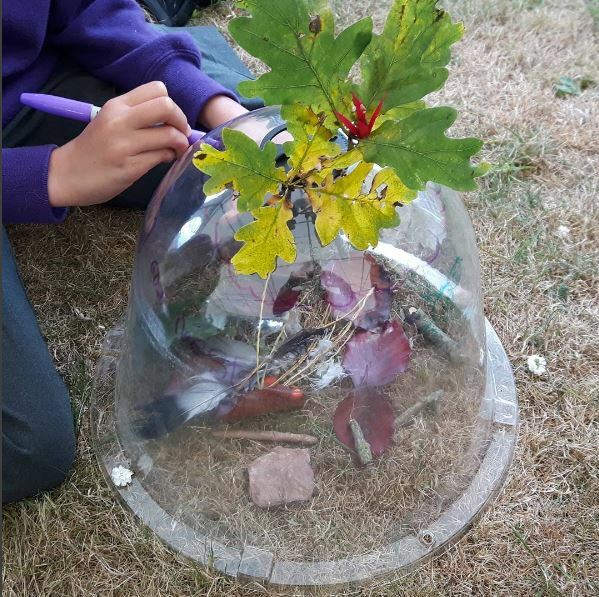 In the afternoon the older children also had time to create imaginary Halsway terranium worlds in little domes. Found materials were collected and sculptures made of things in their worlds. The domes could also have explanations, decorations and poetry written straight onto them. This project is a commision by Somerset Art Works through their Momentum programme, funded by Arts Council England. Momentum is the theme of Somerset Art Works’ (SAW) creative programme between 2015 – 2017. Artists, curators and artist-led groups are invited to work with SAW to create new work exploring aspects of the theme through contemporary visual arts and craft. Artist Rebecca Moss, Alice Maddicott and Simon Lee Dicker were selected in April 2015 to create new work, to be presented across Somerset during Somerset Art Weeks Festival 2015 (3rd to 18th October 2015), in any media, taking a different approach to the theme of ‘Momentum’, setting the work within different environments and communities of Somerset. Alice is delighted to be commissioned again in 2016.